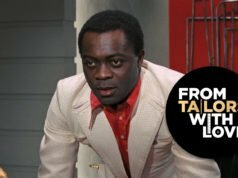 Live and Let Die‘s villain Dr. Kananga may not be into flashy 1970s trends as much as his alter ego Mr. Big, but even as himself he liked wearing creative clothes. 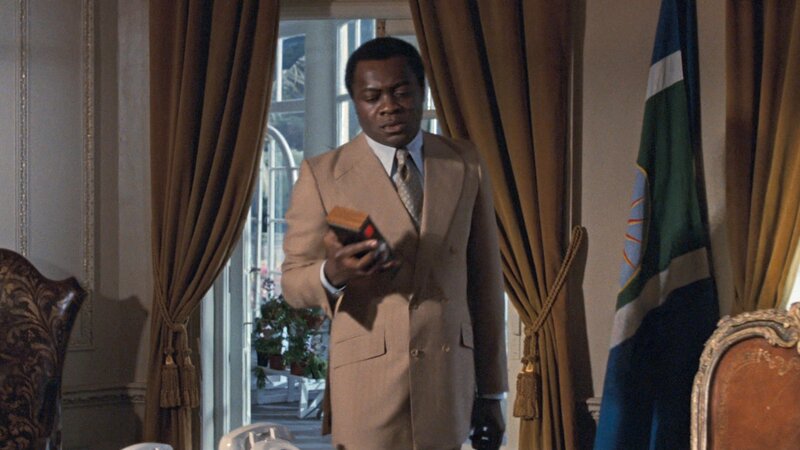 Roger Moore’s tailor Cyril Castle dressed Yaphet Kotto in some unusual clothes, and his tan suit is reminiscent of what Roger Moore might have worn in a 1968 episode of The Saint or in The Persuaders. The colour of the tan suit is perfect for the tropical climate of San Monique. It has a very subtle triple-shadow-stripe pattern. The cloth is wool or possibly a wool and silk blend. This suit is not as flashy as the purple suit that he also wears in the film, but this suit is more appropriate for the leader of an Island nation. Kananga is a fan of double-breasted suits, and his tan suit is in the classic button two-show three (6×2) configuration with Cyril Castle’s signature narrow wrap. Kananga fastens both buttons, which is a legitimate way to fasten a double-breasted jacket since the front is cut straight. The jacket is detailed with an unusual Ulster collar instead of the standard peaked lapels. Castle had previously made a double-breasted suit with an Ulster collar for Roger Moore in The Saint. The lapels on this style are straight on the top edge like notched lapels, but the collar follows the top edge of the lapel so there is no notch. The Ulster collar comes from the Ulster overcoat and is most commonly seen on pea coats and double-breasted trench coats. It can also be found on greatcoats. On a suit jacket it is an odd twist, but it does have an historical origin in double-breasted outercoats. There are no buttonholes in this suit’s lapels. The breast pocket is the standard welt pocket, mostly obscured by the wide lapels. The hip pockets are slanted with flaps. The back of the jacket is detailed with long double vents. 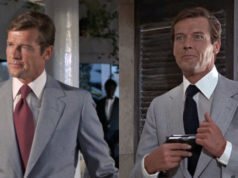 The jacket’s cuffs are the flared link style cuff that Roger Moore also wears throughout Live and Let Die, where the ends of the sleeves flare out and kiss like a shirt’s double cuff rather than overlap. The flared cuff reflects the likely shape of the trouser legs (which are not seen), though this cuff does not necessarily need to be paired with flared trousers. Roger Moore wears this cuff in The Persuaders in 1971 when he was still wearing narrow trousers. 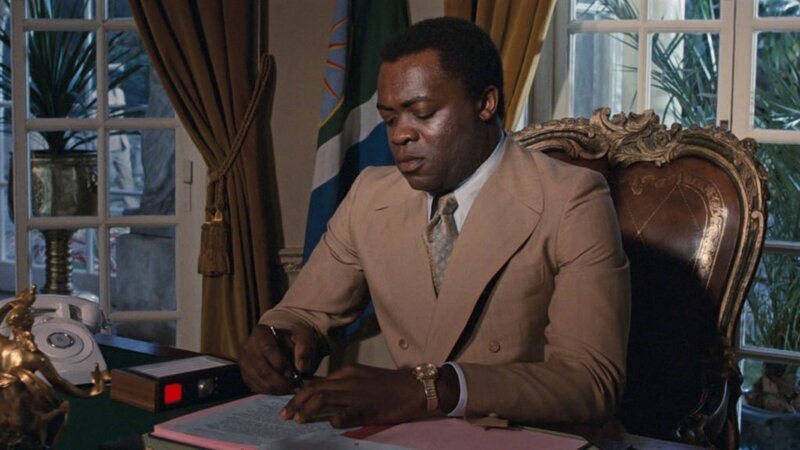 Kananga’s cuff has a wider flare than Moore’s has, since he needs to look flashier as the villain, but the flare gets in the way when he has his hands at his desk. The jacket is cut with a softly padded but straight shoulder and gently roped sleeve heads. It has a lean chest and a suppressed waist. The trousers are not seen but likely have the same slightly flared cut that Kananga’s other double-breasted suit trousers have. 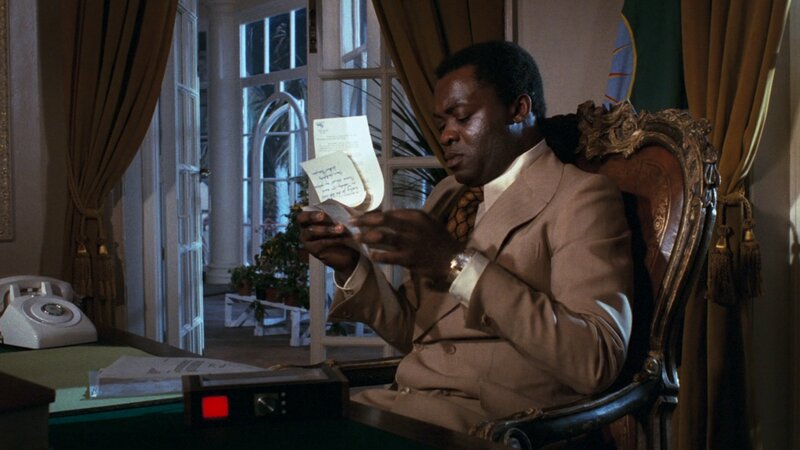 Kananga wears this suit on two brief occasions with two different shirts and ties. The first is with a pale blue shirt and an orange silk tie with a woven pale blue pattern of diamonds and rotating fleurs-de-lis. The second shirt is made of a shiny and semi-sheer cream silk crepe de chine and is paired with a black silk tie that has a printed orange honeycomb pattern. 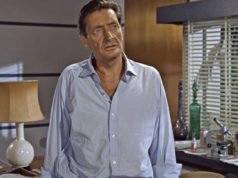 Both shirts have long point collars and rounded two-button cuffs and are made by Roger Moore’s and the Bond series’ shirtmaker Frank Foster. 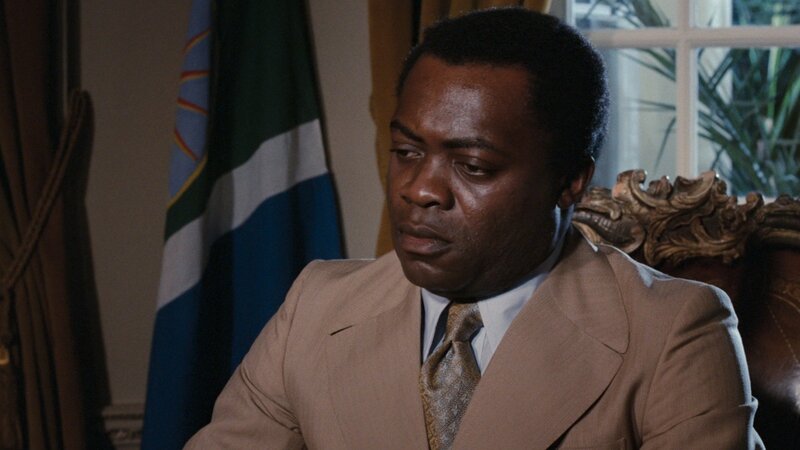 Kananga uses a four-in-hand knot to tie his ties. Is Professor Dent Wearing James Bond’s Shirt? Interesting that he’d wear a barrel cuff shirt with the flared jacket cuffs when the flared jacket cuff is so much better suited to fitting French or cocktail cuffs than a standard jacket cuff can be. 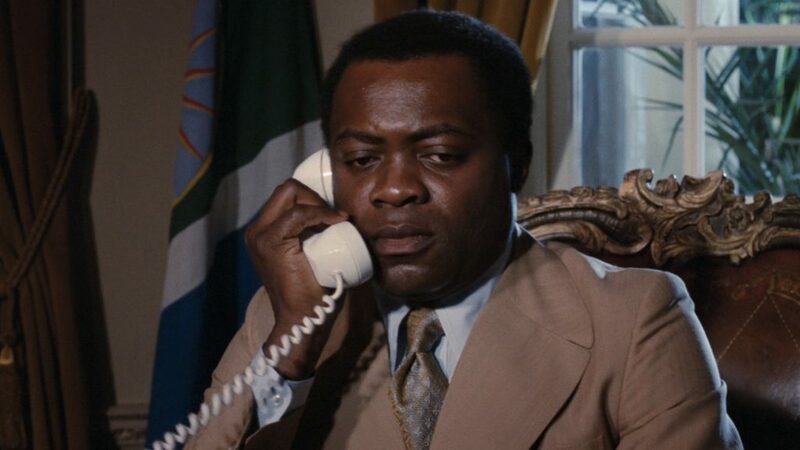 I also like the subtlety of using the fleur de lis patterned tie on a Papa Doc surrogate who also rules an island nation with a French name, and presumably former colonial past. I don’t find these jacket cuffs at all suited to French cuffs, since the cuff shape is the same. Roger Moore always wears the flared jacket cuff cocktail cuffs, but I don’t see how button shirt cuffs behave any differently with this jacket cuff than cocktail cuffs would. Why wouldn’t the cuff shape being the same help? It keeps the shirt cuff from moving around or getting squashed or folded within the jacket sleeve, which could lead to interference when the shirt cuff needs to move in or out of the jacket sleeve. But the fabric is solaro? I thought it was Solaro at first, but I saw that it’s something else after having a closer look. I have never seen a striped Solaro, though this is likely woven with multiple colours in a way that is similar to Solaro. Solaro is woven in gabardine or gabardine herringbone. Matt – do you know if there is such a thing as a single-breasted Ulster jacket? The single-breasted ulster coat appeared in On Her Majesty’s Secret Service. Thanks – sorry I should have clarified sports jacket or suit jacket. I know it is possible in practice, I just haven’t been able to find any examples.